Are you looking for an hotel near Brescia and you don’t know which one to choose? 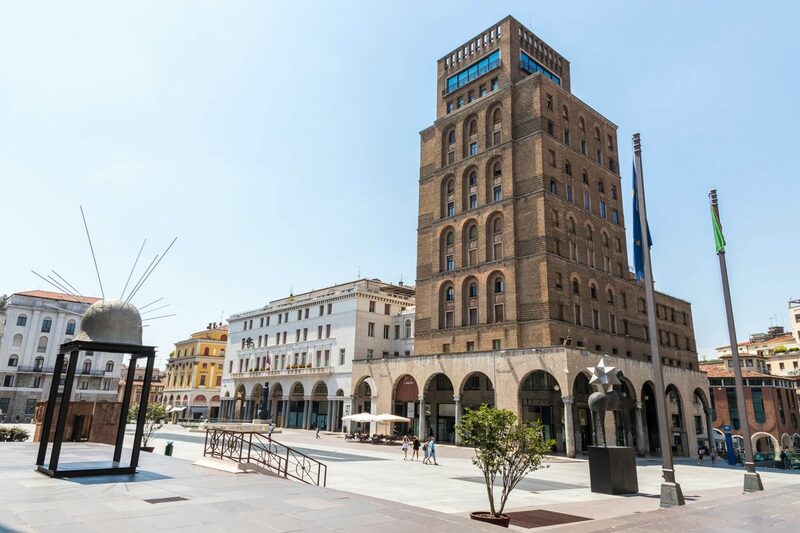 Thanks to the proximity to Brescia and to the coziness of rings roads and motorway you can easily reach in a few minutes all the main cities attractions such as Brescia’s Fair, the MUSIL (Industry museum of Rodengo Saiano) and the Mille Miglia Museum. THE CAPITOLIUM AND THE ROMAN FORUM – The temple was built by Vespasian in 74 A.D., as the partly restored dedicatory inscription on the pediment shows. The capitolium site had a terrace on three sides with the temple in the middle and two lateral rows of arcades stretching down towards the Forum. The flight of marble steps, which has been restored and made up with bricks, led up to the podium of the raised pronaos, which is characterized by a hexastyle central porch with Corinthian columns about 11 meters high, which were restored during the nineteenth century reconstruction works. Traces of houses, burial places and productive plants of Longobard period can still be seen in the nearby archaeological area, superimposed or included among the remains of Roman worship buildings. 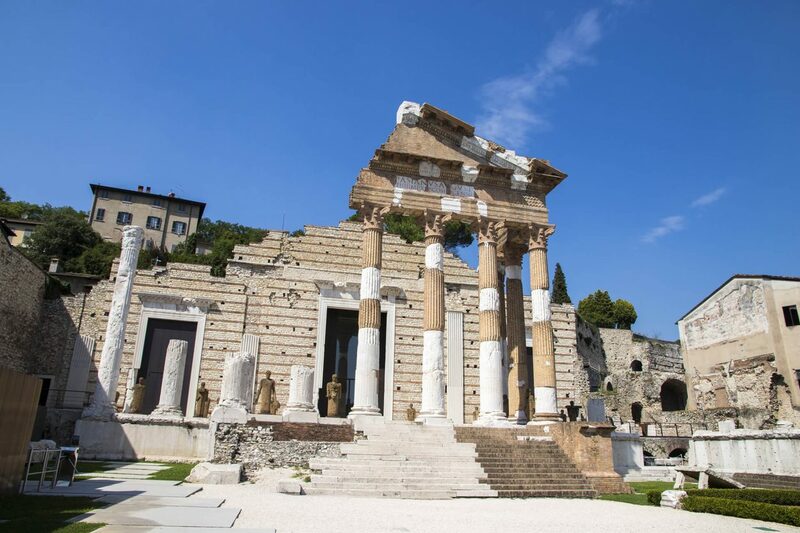 For this reason the archaeological area is included in the UNESCO World Heritage List together with the complex of San Salvatore-Santa Giulia. 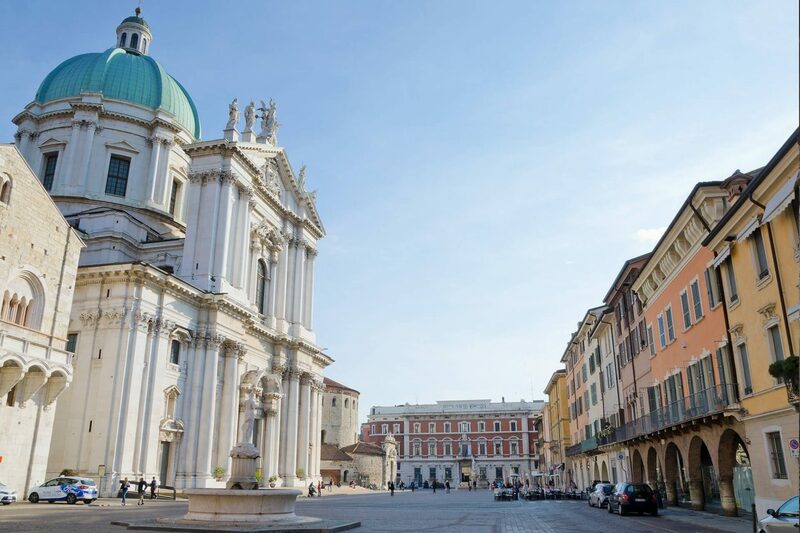 THE BRESCIA’S SQUARES – The historic center of Brescia is at the center of 3 large squares: Duomo Square, Loggia Square and Arnaldo Square. The Duomo Square, which dates to the Middle Ages, is the heart of the city; it contains important historical buildings which symbolize the city’s concern with civil rights as well as its religious tradition. The palace of Broletto, which incorporates the municipal tower and the Loggia delle Grida, extends along the eastern side as well as two cathedrals – the Duomo Nuovo (the New Cathedral) and the Duomo Vecchio (the Old Cathedral). The Palace of the Broletto is the oldest municipal building in the city and was the center of political life when Brescia was a city-state. It has a square ground plan with an internal courtyard which was built in stages from the Middle Ages up to the XVII century, when an open bossed arcade was added to the north side. 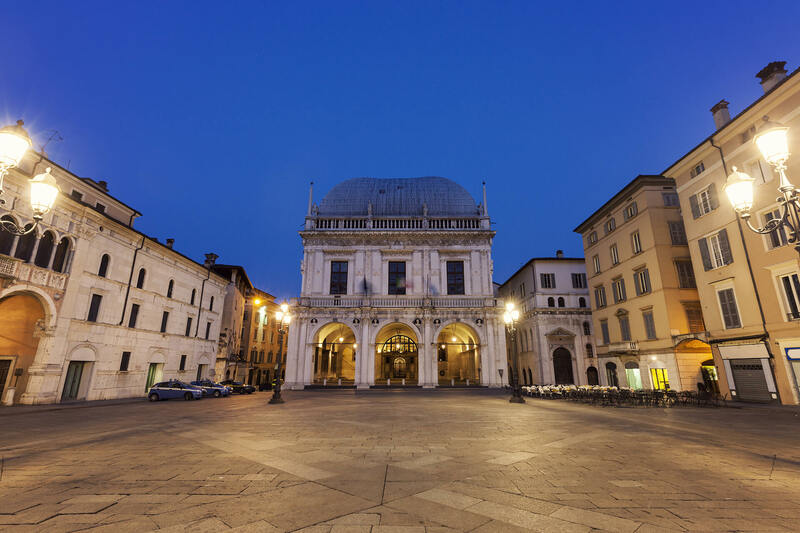 The Loggia Square is the most beautiful square in Brescia and was inaugurated in 1433. It is dominated by the magnificent Renaissance Palace of the Loggia, nowadays the town hall. Its building began in 1492. 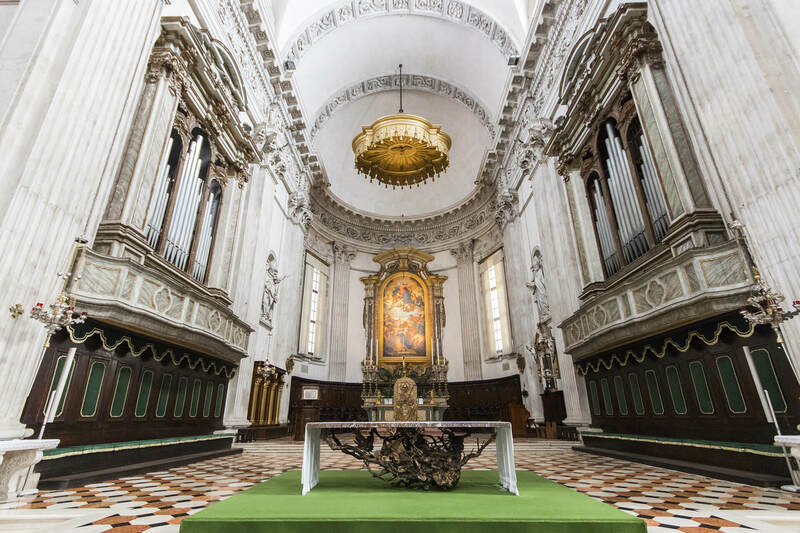 The upper part was finished circa 1570 to the design of Jacopo Sansovino and Andrea Palladio. The splendid decorative sculpture that adorns the palace is in classical style. On the south side, the 15th and 16th century façades of the Monti di Pietà are worthy of note as tombstones and other pieces of Roman stonework have been set into their walls. 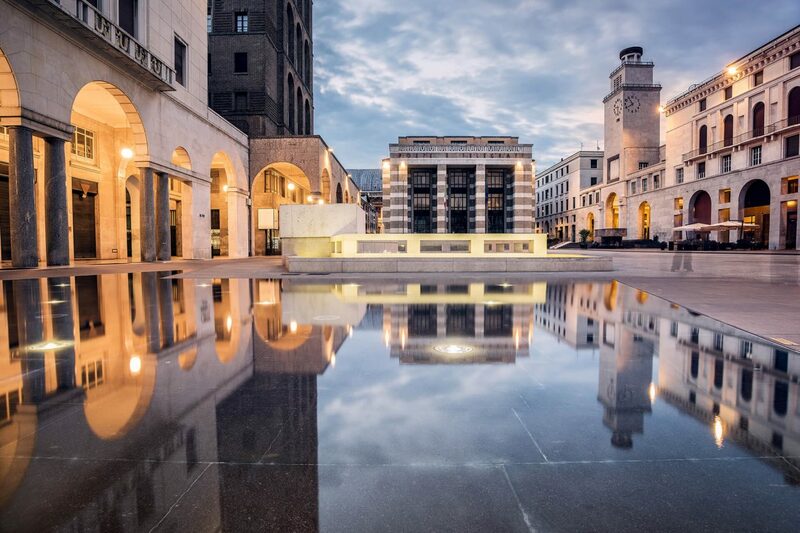 The Arnaldo Square is a XIX-century square, which is called after the famous monk, Arnaldo of Brescia, is a significant example of urbanization combining “public utility” with “magnificence”. The vast square and the adjoining long building with its arcade were built to provide an area for the corn market, which was previously held in Piazza Loggia and then in Via San Faustino. The Corn Warehouse, inaugurated in 1823, is considered one of the finest examples of Brescian neo-classical construction, with its solemn row of bossed arches and a fountain at each end. The building was 111 meters long and included twelve storage-rooms in the basement and as many again on the ground floor. To the granary store was added a toll house, effectively closing off the square. MUSEUMS – There are two principal museums to visit. First of all the convent of San Salvatore, later named Santa Giulia in 915 A.D., was founded at the wish of King Desiderius and his wife Ansa in 753 A.D., and built on a particularly rich archeological site (the remains of Roman domus have been found under the basilica of San Salvatore and in the kitchen garden of Santa Giulia. Considerable enlargement and reconstruction over the centuries produced a building constructed round three cloisters, as it is today. Major alterations were made in the time of the city states (XII century: rebuilding of the cloisters, enlargement of San Salvatore’s crypt, building of Santa Maria in Solario) and in the late XV century ( complete rebuilding of the cloisters and addition of the north cloister of dormitories, raising of the nuns’ choir and repositioning of the front of the church of San Salvatore, which was in turn destroyed and completely redesigned when the new church of Santa Giulia was built in 1499). The Mille Miglia Museum was an initiative to launch a museum dedicated to the Freccia Rossa, It was conceived and brought to fruition by the Association Museo delle Mille Miglia Città di Brescia, incorporated in December 1996 by the Brescia entrepreneurs Amici della Mille Miglia. Today the Association has 50 members. The new museum was opened to the public on November 10, 2004. 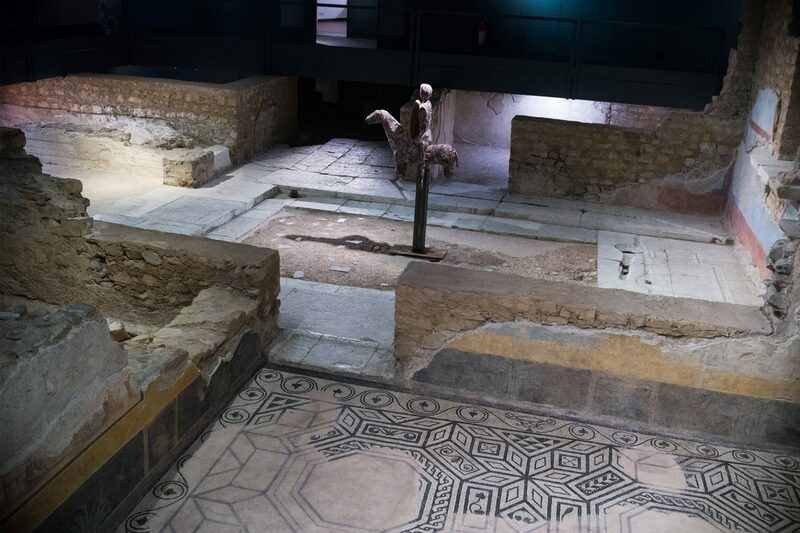 The initiative entailed the restructuring of the monastery complex of Sant’Eufemia, which is owned by the City of Brescia, providing the opportunity of recovering a building of great archaeological, historical and architectural value that had been left in decline for many years. The location of the Museum in a site of such historical significant is totally different from all the other automobile museums: The Museo Mille Miglia conserves a history, relates a myth, and day after day provides a live testimony to a period of our past. BRIXIA FORUM – Brixia Forum is the Exhibition Centre of the City of Brescia, modernized and made more efficient recently, able to offer advanced services, hosting events and exhibitions, in a flexible multi-exhibition structure, ready to respond to the changing and evolving needs of the trade fair sector. In addition to the exhibition pavilion, Brixia Forum is made up of a range of Flexible Spaces and Services that complement the exhibition offer or can be used for different purposes.